A Ronan man who was initially charged with sexual assault is receiving a recommended sentence to Montana State Prison for 20 years on the amended charge of aggravated assault. Keith Lee Michel Jr., 28, entered into a plea agreement during an appearance at District Court in Polson on Jan. 2. Lake County Attorney Steve Eschenbacher said the plea agreement calls for none of the 20 years be suspended. 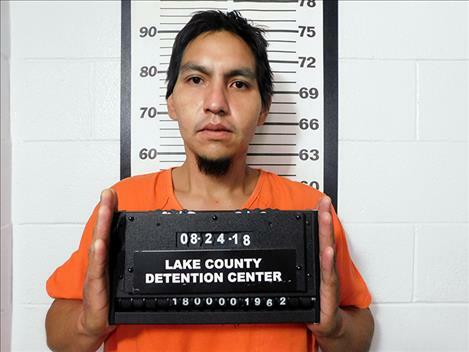 According to court records, law enforcement was called to a disturbance at a residence in Ronan Aug. 24, 2018. As the investigation concluded, responding officers noticed a 4-year-old child who had possibly been abused. The alleged suspect in the new case was a relative at this same residence. Michel was identified as the suspect. He also happened to be wanted on an outstanding warrant on an unrelated matter. When authorities returned to serve the warrant, Michel denied the child was there. The responding officers could see the boy behind Michel and described him as being in a semi-responsive state with visible injuries to his face and body. Lacerations, bruising and a possible bite mark were also documented. The child was transported to the St. Luke Community Healthcare hospital in Ronan where he was diagnosed with pneumonia. Medical staff indicated the child suffered from injuries and large open wounds. The injuries “appeared to be from burns.” A catheter had to be inserted through the boy’s abdomen. He was then flown to Harborview Medical Center in Washington for further treatment. A full recovery is expected. District Judge James Manley set sentencing on the aggravated assault charge for Feb. 13. Michel remains in the Lake County Jail with bail set at $200,000.